(CN) – Launching a new front in his war on red tape, President Donald Trump on Friday ordered federal agencies to speed up environmental reviews and jumpstart major water projects in California and the Pacific Northwest. Doubling as a campaign gift for California Republicans locked in close congressional races in the state’s agricultural heartland, Trump’s presidential memorandum expedites biological reviews of California’s two largest water delivery systems as well as projects on the Columbia and Klamath rivers. Deputy Interior Secretary David Bernhardt says the move will expedite the approval process for certain water infrastructure projects by putting a single agency in charge of conducting environmental reviews. He added that the memo is intended to fix decades of “uncoordinated regulatory actions” and provide “certainty” for California farmers. “Today’s action might be the most significant action taken by a president on Western water issues in my lifetime,” Bernhardt told reporters. The announcement not only interjects the Trump administration into California’s timeless predicament of dividing water between cities, farmers and fish, but also into competitive House races in California’s Central Valley where Democrats are challenging several GOP incumbents. 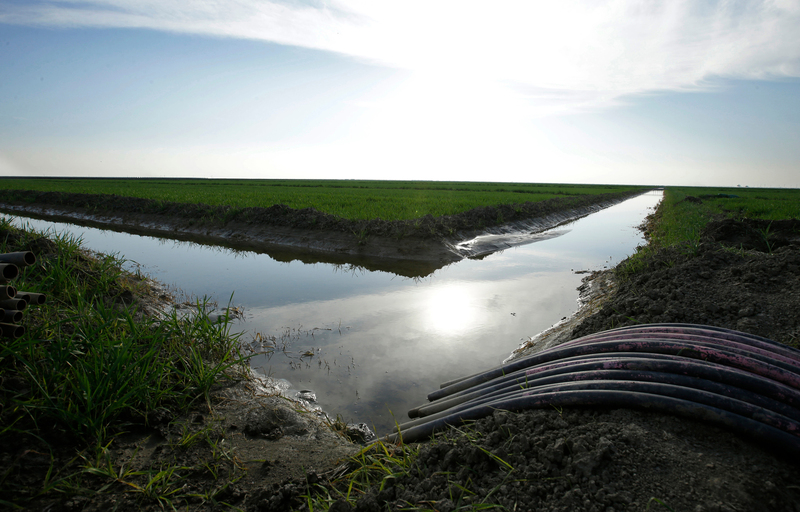 Water issues are perennially hot-button topics in cities like Modesto and Fresno, heavy agricultural districts which traditionally vote Republican. Farming continues to be a major part of the Golden State’s booming economy, as California ranchers and farmers raked in over $50 billion in revenue in 2017 – an increase of nearly 6 percent compared to 2016. Dairy, grapes and almonds were the top producers, according to state data. Denham is referring to the state’s controversial proposal to increase the amount of water flowing from the mountains to the Sacramento-San Joaquin River Delta, and consequentially decrease the supply available to cities and farms. The state water board says more water must reach the delta, a critical component of California’s water supply, in order to stave off the collapse of salmon and other endangered fish species. Critics call the proposal a “water grab” and an assault on the agricultural industry. Denham and four other California Republicans seeking re-election posed with Trump Friday in Arizona. The president called the California Republicans “tremendous people” while signing the water directive. “Some of the best farmland in the world, by the way, can’t be used because they don’t have water; but they actually have a lot of water,” Trump said, flanked by Denham, Rep. Kevin McCarthy, R-Bakersfield, and others. Others were less amused by the order. Restore the Delta, a group dedicated to protecting the San Francisco Bay-Delta estuary, called Trump’s order a political stunt meant to save congressional seats ahead of the Nov. 6 election. “War has been declared on our home by the Trump administration,” the group’s executive director Barbara Barrigan-Parrilla tweeted Friday. Friday’s memo doesn’t mention the water board’s latest proposal but aims to speed up contract changes for the federally operated Central Valley Project and California’s State Water Project. The two projects work in conjunction and supply Central and Southern California with a majority of its water. The memo directs the Interior Department to issue final biological assessments for the two projects by Jan. 31, 2019. A senior administration official said Trump’s memo will designate a singular official to oversee each project and propose a plan to “suspend, revise or rescind perspective regulations that unduly burden” water projects.